From the earliest days our obsession with toys has been evident. Bankston's large inventory of vintage toys and current releases is a fun escape from the daily grind of the REAL world. Bankston's stock includes such classics as Mego, G.I. Joe, Star Wars, Star Trek, Transformers, He-Man Masters of the Universe, DC Direct, McFarlane Toys, Marvel Select as well as new lines from Mattel, Hasbro and Kenner. Bankston's knowledge on toys is unmatched and we can help you complete your collection or playsets. 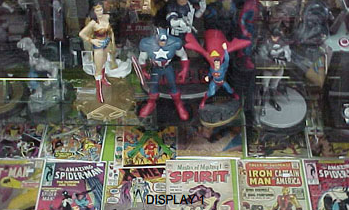 We welcome you to come by and take a look at our great toys form yesterday and today.